School holidays are here. Sixteen days of restful bliss…excepting the planning of teaching for next term (probably three days), a working bee or two to finish projects at school (two days should do it), visits to various schools to water and maintain my garden (four half days, so two days altogether) and visiting friends and family (two days). In the seven days of restful bliss left after that lot I have decided to build myself a bathroom. I’m not planning on killing myself though…there is a plan in place. I have recently taken to wearing a fitbit (one of those wrist band things that tells you how many steps you’ve taken today, how many sets of stairs you climbed and how many times you got your heart rate up, for whatever reason), and the recommended number of steps per day is 10,000. So I plan to build each day (that I have to myself) until my fitbit announces that I have done 10,000 steps (which it does by buzzing in a satisfied way while showing star bursts on the screen), then I will relax and do some everyday house work stuff until the next day. That way I can be sure I’m doing the recommended number of steps per day and get a good amount of work done on the bathroom as well. 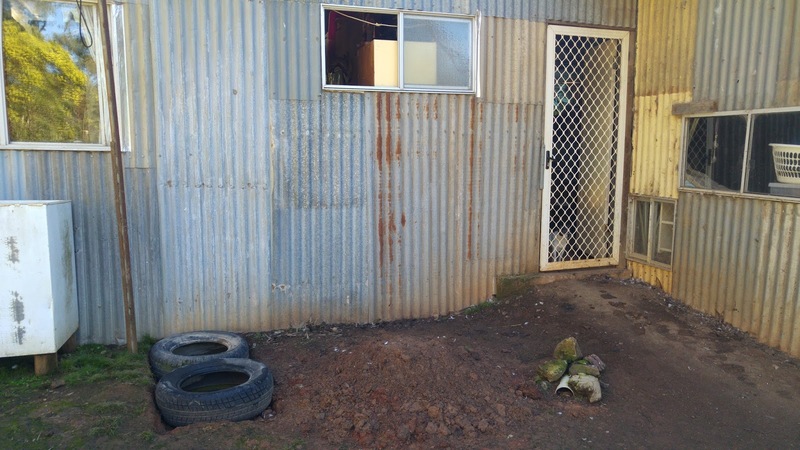 Since the brown snake incident (about 18 months ago), we have been showering outside with a bucket of warm water and a jug. Two winters of outside showering is enough for me, I want a bathroom. 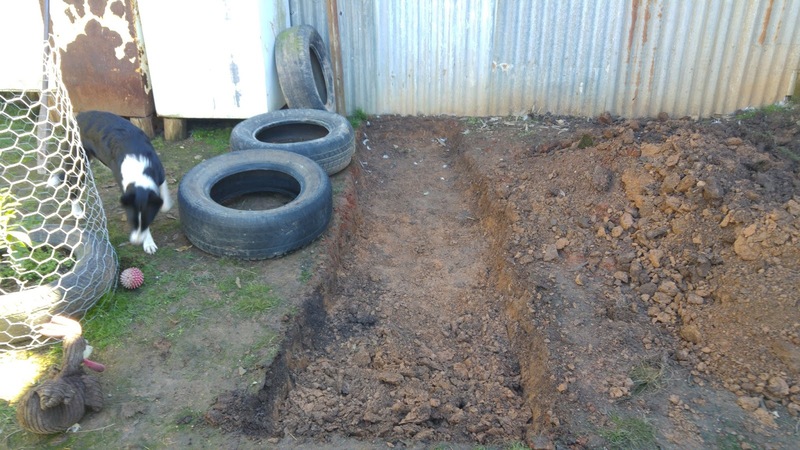 After much discussion and research I decided to have a go at earthbag building. This method involves filling polypropylene feed bags with soil and stacking them into walls with barbed wire between each layer. These walls are then rendered with a mix of clay soil, sand and cow manure to protect them from the sun. In the videos and books this method looks quick and fairly easy, I guess we will see. The first step was to find a site. My barely present partner put his foot down and refused to walk up the yard in the dark to shower each night (even though we have been doing just that for 18 months now). Building the bathroom and laundry up hill from the humpy would allow me to gravity feed the water from showering and clothes washing back down to the garden beds, meaning that I don’t have to cart buckets of water around the yard every wash day. Building right outside the back door means that we don’t have to go outside to shower and we don’t have to carry our washing baskets up the yard to the laundry for the once a week washing day. 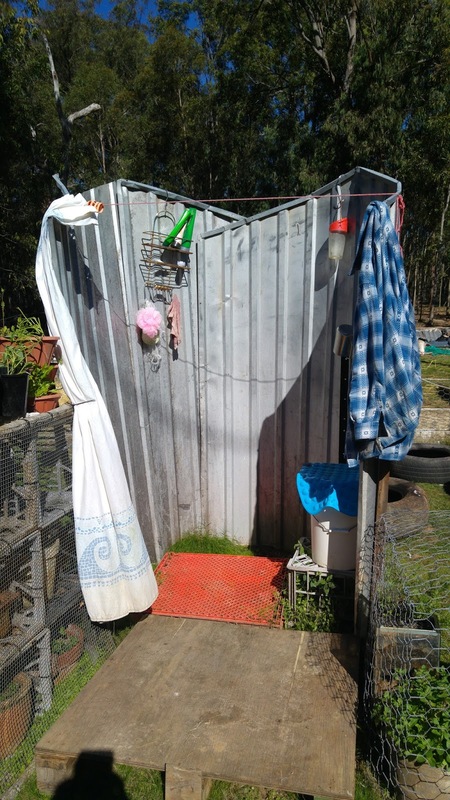 So it was decided to put the bathroom directly outside the back door, conveniently placed for access, but inconvenient for gravity fed watering of the garden. The ‘right outside the back door’ area. 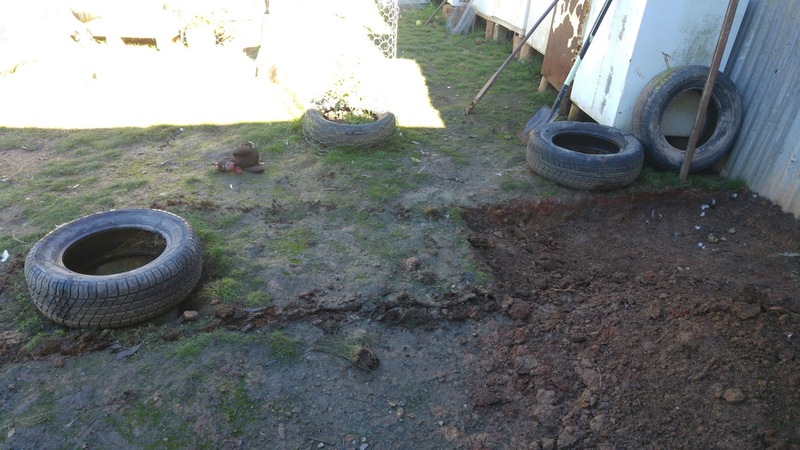 The foundations will be a shallow rubble trench filled with gravel and a layer of tires on top of that (also filled with gravel). 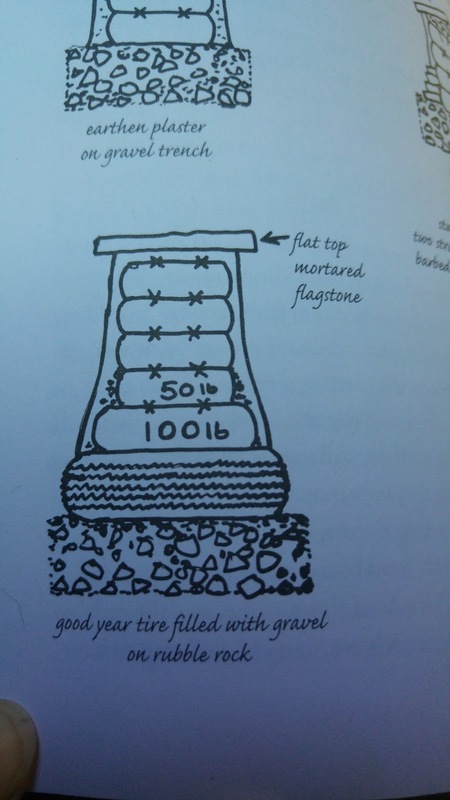 I am considering a row of bags filled with gravel on top of the tires just to provide the drainage and protection from wicking moisture that earthbag buildings require (apparently). My first, second and third days of holidays were spent digging out the trench, a not-too-arduous job considering the usual digging requirements of foundations. 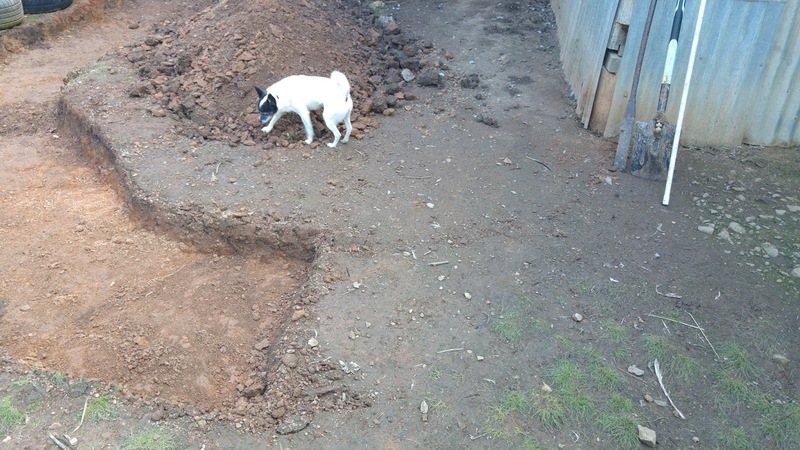 As you can see, I had the doggy building inspectors around once or twice. 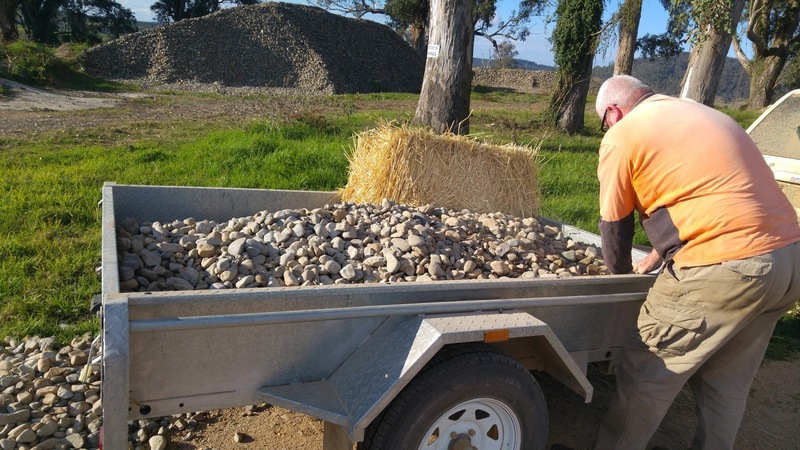 On the next available day we (my partner and I) drove down to the conveniently placed Tabulam Sand and Gravel (our local cement depot) and picked up a load of river rocks for the bottom of the foundation trench. I couldn’t believe this was a tonne of rocks. 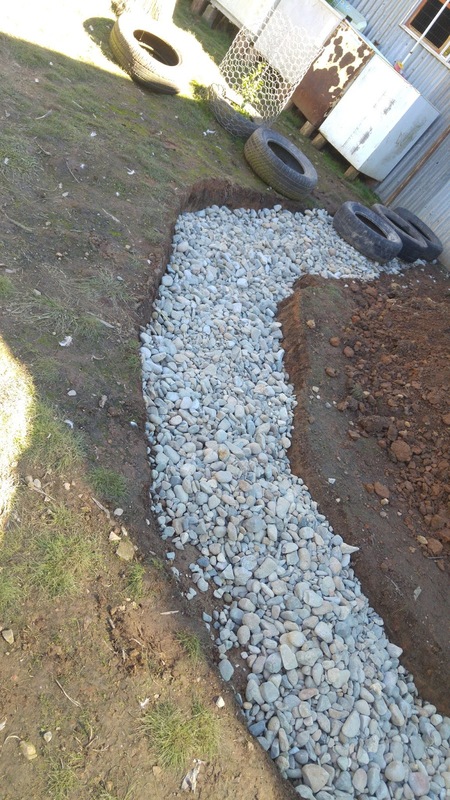 I believed it was a tonne of rocks once my partner, daughter and I wheelbarrow-ed and shoveled it into the trench. You may notice that my foundation trench is very shallow. At its deepest it is only 25cm deep. 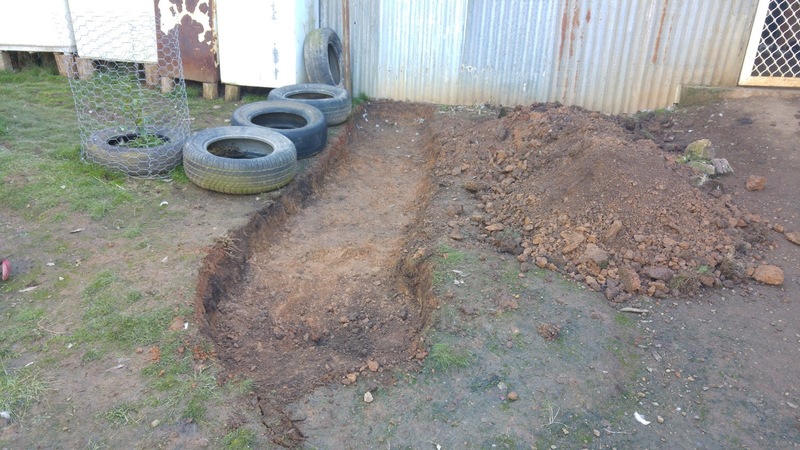 Most earthbag sites say that the foundation rubble trench doesn’t have to be deep, so I went with that. Also I hate digging so the shallower I could get away with the better. I plan to get another load of smaller gravel to put on top of this load and to fill the tires. That should give a fairly stable base for the wall to be built on. This is the foundation option we have chosen Its from the book ‘Earthbag building’ that I conveniently have in my library. Hopefully I can arrange another trip with the trailer to pick up some more gravel within the next day or two. I am looking forward to the next stage; filling the bags with soil and tamping them down. I see that I am reading your posts in reverse, so please excuse questions that you have already answered. I am wondering about those winter showers. Do you live in a warm climate? I was hoping to be on my land by now so that I could get settled in before the cold and have my solar panels up and foam blocks fitted to windows. We have already had our first freezing night. Yikes! A spring move is looking better and better. I should still be able to do some prep over the winter, but brrrr…. we’ll see. A thirteen degree January day might just do me in. I live in a fairly sub-tropical area which does, on occasion, get down to freezing. The winter showers are cold for us because we are acclimatized to high temperatures (40 degrees Celsius in summer). I would wait until warmer weather to move if I were you; it is hard work getting used to a rough lifestyle in the cold. I will continue to post about our building as I go, thank you for reading.